Elias Holl was the son of the architect Hans Holl (1512-1594). His father taught him his trade and in 1596 he passed the master's exam. After a visit to Bolzano and Venice he became Werkmeister of Augsburg. He designed and built the City Hall in Augsburg and he built many buildings designed by himself as well as by others. In Augsburg he built the Heiliggeistspital and in Eichstätt the Willibalsburg. In 1629 he lost his position because he was a protestant and from then on he worked as Stadtgeometer. In 1631 he was dismissed from office entirely. 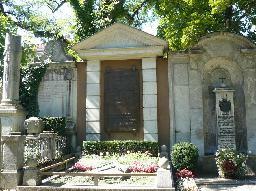 The grave of Elias Holl at the Protestantischer Friedhof, Augsburg.